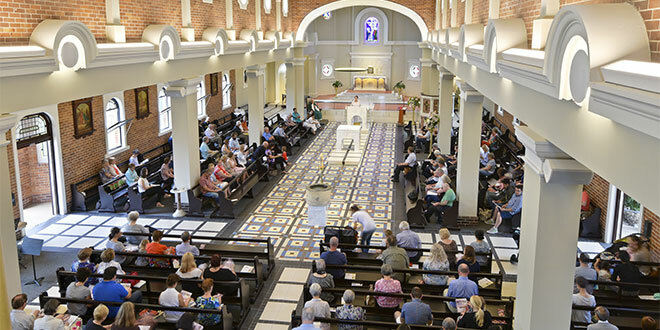 THE $1 million restoration and renewal of Bulimba’s Church of Sts Peter and Paul has had a particular impact on the youngest members of the community – so much so that they’re paying more attention at Mass. Parish priest Fr Tom Elich said that’s the message he’s had from the parents in his flock. “People have said to me, for example, that their children are much more engaged in the liturgy because they’re not sitting 20 rows back with everything happening in the distance,” he said. Bringing people closer to the actions of the liturgy has been achieved with a reconfiguration of the interior design of the church. The altar, ambo and baptismal font are positioned along the centre of the church, and surrounded on three sides by the pews facing inwards. “The whole experience of (the people) being present as ‘doers’ of the liturgy is reinforced,” Fr Elich said. The parish celebrated its centenary on June 29, the feast of Sts Peter and Paul, when Archbishop Mark Coleridge rededicated the church, which was built in 1926. Fr Elich, who is Liturgy Brisbane director, said the maintenance work on the church was needed for theological, or liturgical, reasons as well as for practical ones. “It’s been very obvious to me that the liturgical arrangement previously was inadequate,” he said. This was addressed when a maintenance report showed the church needed a new roof, new brickwork and repainting as part of a major refurbishment. Fr Elich said the liturgical renovation became part of that five-year project. “If you said to people in 1926 when the church was built, ‘Who celebrates the liturgy?’, their answer would’ve been ‘Christ celebrates the liturgy, that is, the priest acting in the person of Christ’,” he said. “If you were to ask people now, ‘Who celebrates the liturgy?’, we would say ‘Christ celebrates the liturgy, that is, the whole Body of Christ – the community of all the baptised’. “Now, that shift in theology – that understanding that came out of the Second Vatican Council – really demands a whole different way of thinking about the liturgical space so that the priest is not just there all by himself right at the front but that altar and the ambo are there in the midst of the people. “And so that’s what we’ve tried to do with this arrangement.” Fr Elich said there was “a lovely sense of the people gathered around the altar and the ambo, and I think that’s been enhanced by the fact that the assembly is well balanced, so we’ve got a good number of people on either side of the altar and ambo, as well as at the far end”. “And people are using it well, so they do sit on all three sides and that really gives a lovely sense of community,” he said.